Your little dino is growing fast. 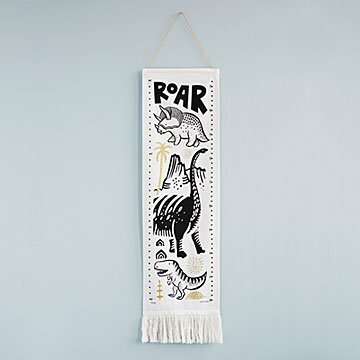 Mark every inch with this prehistoric cotton growth chart. You know what they say, "one minute they're a toddler, the next a T. rex." Mark every inch of your little dino's growth with this adorable prehistoric piece. Screen-printed on cotton, the design reaches up to five feet (about the size of a young triceratops) and features fun illustrations of Jurassic pals. Bring it to a baby shower or birthday to make everyone roar with delight. Made in India.